Underline notes and remind yourself of important information with these Sharpie chisel tip fluorescent highlighters. Ensure you can find important information again with this 5-pack of fluorescent yellow highlighters. Producing bright, bold color and designed for easy gliding and smooth application, the chisel tips create wide or narrow lines as required. 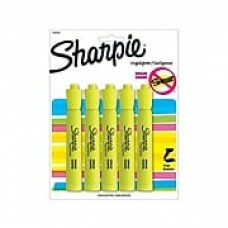 These Sharpie highlighters are long lasting and resistant to smearing.